Vital Farms – Search Engine Optimization | ASTRALCOM - Content Strategy, Conversion Marketing and Customer Acquisition. Vital Farms – Search Engine Optimization | ASTRALCOM – Content Strategy, Conversion Marketing and Customer Acquisition. We’re just getting started here. After an initial 3-month run on our Search Engine Optimizer program, Vital Farms achieved a significant increase in organic visits by more than 25% and an increase in referral traffic by nearly 35%; contributing to a lift in overall sessions by more than 24%. 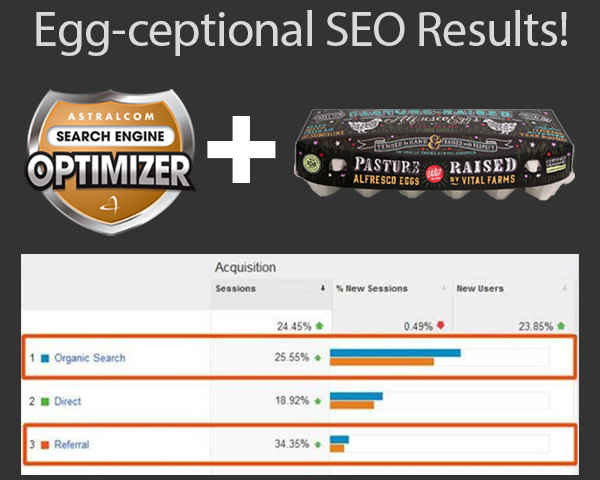 Read more about the egg-ceptional SEO results we delivered for Vital Farms in this post. Then contact us for a discussion about achieving your SEO obectives.